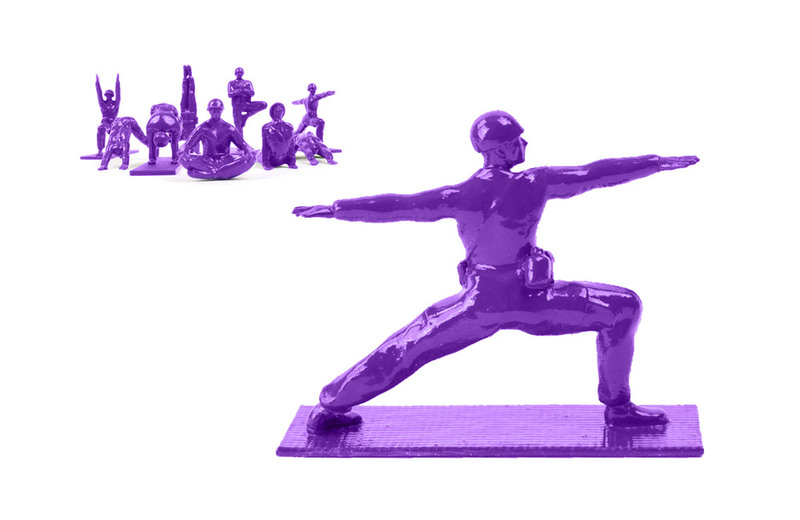 Yoga Joes are Little Green Army Men with a Zen twist! Created by Dan Abramson, each set includes 9 Joes in various classic yoga poses, including Headstand, Meditation Pose, Cobra Pose, Warrior One, Warrior Two, Child’s Pose, Tree Pose, Crow Pose, and Downward-Facing Dog. Figures range from 1″-3″ in height and are made from rigid, ABS plastic – the same material current used to fabricate modern LEGO blocks. They come packaged in a Zen yoga studio, complete with a bamboo floor – perfect for maintaining inner peace. After a wildly successful Kickstarter campaign in 2014, Abramson has continued to sell the 9-piece sets in traditional green for $25. After a sold-out limited-edition run in pink, a new color option has been added: “purple midnight” retailing for $40. The classic phrase “You sank my Battleship!” gets a Cubist spin in the Dazzleship Battleships game from Laurence King Publishing Ltd.
Workman Publishing's Paint by Sticker book series applies low-poly art to the paint-by-numbers concept.